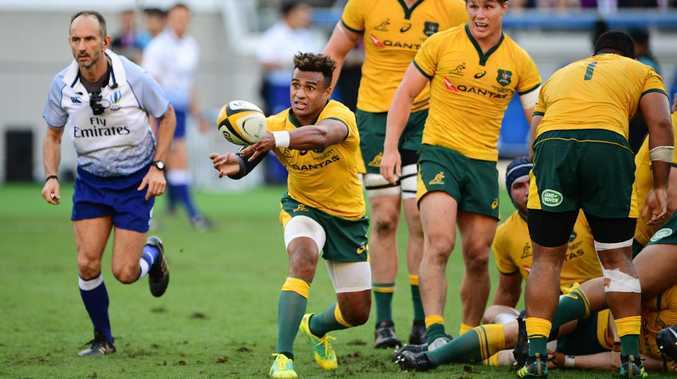 WILL Genia is the Wallabies' great believer and is certain an overdue grasp of tactical changes, to better involve the team's big boppers, will pay off before Japan's Rugby World Cup. The Wallabies have just seven Tests until the Cup kick off in Sapporo in 11 months to rid themselves of the gremlins that have beset their seven losses this year. Beating the Welsh, in their magnificent roofed stadium, in Cardiff on November 10 when rain, wind and tricky handling conditions are eliminated will be a pure test tube for the Wallabies to finally get it right for 80 minutes. 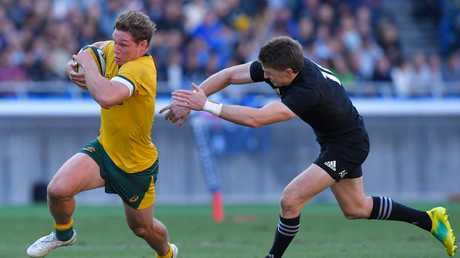 The Wallabies spent their lead-up to the June series against Ireland working on moves and mindset to get the ball quickly to the edges but their 97-Test halfback admitted adapting to different methods had come far too slowly since. A crashing 25m run in midfield from prop Scott Sio, No.8 David Pocock spearing through off a neat Bernard Foley short ball and lock Rob Simmons rumbling to the try-line, only to be held up, were strong examples of it clicking against the All Blacks in Yokohama. "It's no secret we changed the way we played a lot for the June series against Ireland when we played with width from the get go," Genia said after the 37-20 loss last Saturday. "Now, we have adjusted back to how we played before which is getting the forwards going through the middle then playing off the back of that." The record comeback Test in Salta was only won over Argentina that way and it took the cross-field bumbling of the Gold Coast loss to the same team to reinforce this simple truth. "It took us a little time to adjust but we are here now and the boys are doing it well because we've got some of the best ball-carrying tight forwards in the game," Genia said. "We've spoken about utilising guys like Allan (Alaalatoa), Keps (Sekope Kepu), Scotty (Sio), Folau (Faingaa) and Tolu (Latu) and the variation coming later." Coach Michael Cheika's own analysis was not rushing away the benefit of another seven line breaks by "being too pushy" in Europe as was the let-down against the Kiwis. Genia said spirits would be high heading into Tests against Wales, Italy and England next month because he reinforced that the Yokohama effort was the best of the three Bledisloe Cup Test displays this year. "If the performance itself was disappointing everyone would have their heads down but I think there were definitely areas where we improved, not just from Bledisloe I and II but in general," Genia said. "Some blokes are afraid to say it but we go out there to win every game. We are going to Wales, we are going to England and that's the mindset that we have. "We've spoken a lot about the end goal being the World Cup and it's about not necessarily taking the games leading up for granted but using them as stepping stones."